Madison Public Schools in Madison, ME teamed up with their local tomato farmer to bring the Farm to School movement to the district, giving students access to fresh and healthy options every day. In 2015, nearby Backyard Farms donated a salad bar to Madison Elementary School through the Salad Bar to Schools grant program. Backyard Farms, a large-scale hydroponic tomato farm, learned that Madison Public Schools was on the wait list to receive a salad bar so they could incorporate more fresh, nutritious food into their school lunch menu. The farm saw this as an important opportunity where they could impact the health of the community’s students, many of them their employees’ own children. This created an important connection between the school district and larger community centered around healthy eating. Doris Lindblom has been the Food Service Administrative Assistant at Madison Public Schools for 28 years. She and her team are wholly dedicated to the health and well-being of the children they feed each day. Her daily mission is simple, “when you work for a school system, the goal is to help kids in any way you can.” When Backyard Farms stepped in and donated a salad bar to the local elementary school, the community was thrilled. 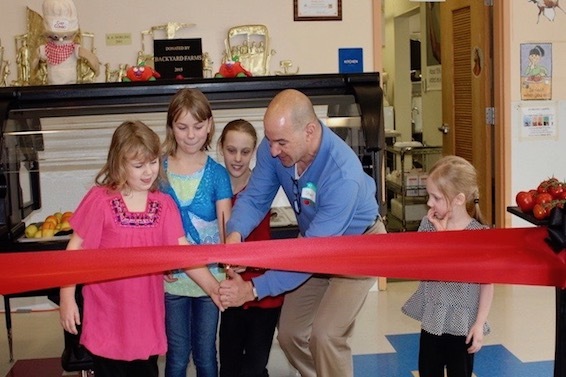 The local news station broadcast the salad bar dedication ceremony, which included a ribbon cutting ceremony with the students and the president of Backyard Farms. The salad bar has also been an excellent way to engage with Madison’s agricultural community by incorporating local produce into the school menu. They have continued to work with Backyard Farms by purchasing all their tomatoes from the farm. Since the farm is a hydroponic green house, they are able to supply their tomatoes locally year-round, a feat not to be underestimated in the winter months in northern Maine. North Star Orchard in Madison supplies the entire district with apples and pears as well. In the spring, fiddleheads can be found throughout rural Maine. 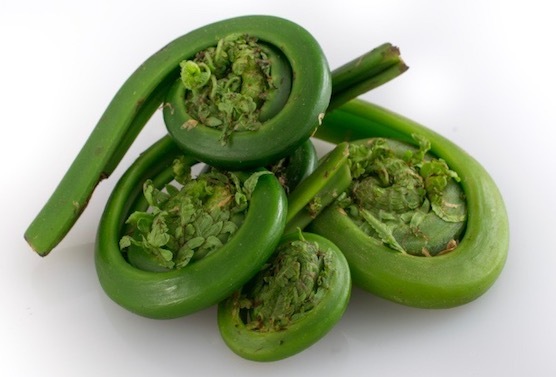 Fiddleheads are the coiled fronds of a fern before it unfurls into the broad greens we commonly recognize. The kids love these quirky little veggies and request them for the salad bar when they are in season. The collaboration of Madison Public Schools and Backyard Farms shows how communities can deliver creative solutions to health and wellness needs. By aligning values, such partnerships fuel the mission of the Salad Bar to Schools grant program. “It works great for us. And it’s still working great three years later. That says a lot. We are grateful to have the opportunity,” says Ms. Lindblom. The Salad Bars to Schools grant program has been an incredible resource in Madison Public Schools. They are looking forward to growing the program in their remaining schools. Soon those magical little fiddleheads will find their way to the salad bars at Madison Middle and High Schools!